Main page » Ricardo "El holandés"
Tango de salón he learned by dancing in the Dance salóns (milongas) in the 14 years he lived in Buenos Aires. He took classes with "grandes maestros"like Rodolfo Dinzel, Antonio Todaro, Eduardo Arquimbau, Roberto "El alemán" Thonet, Cacho Montegassa and others. Since 2003 he gives lessons with Rotraut Rumbaum. Tango classes in courses and workshops. Tango de Salón and choreography. Lessons with Rotraut in Germany, Buenos Aires, Holland, Italy etc. Over 40 tangotravels (tango holidays) with Tangotours, IBP, etc Schauspiel.de etc, to Italy, France, Greece, Spain and Germany and so on. 5 Instructional DVDs: Tango de Salón I and II, Fantasía de Tango, Milonga and Vals. 1988 - 2002 "Ricardo y Nicole"
Together with Nicole Nau, dance partner from 1988 to 2002, Ricardo lived in Buenos Aires performed and teached in Buenos Aires. RyN toured all over the world. Their artistic name was "Ricardo y Nicole". They teached in their own dancestudio in San Telmo at the Plaza Dorrego. They choreographed several shows and produced the tango opera "Orestes last tango". Appearances in milongas to Club Sunderland, Sin Rumbo, l'Akkarense, Villa Malcolm, Los de 40, Glorias Argentinas, Club Almagro, Confiterá Ideal etc. Appearance in films "Espiando á Marina", "Comiquisima"
"Solo Tango", Canal 7, ATC, América TV, Canal 13, Canal 9, Volver etc. Ricardo y Nicole received the 1993 COMFER award of the Republic Argentina. 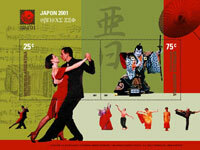 1999-2000 book "Tango Dimensionen" Publisher Kastell Munich. 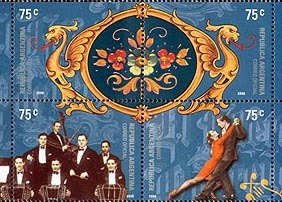 "Tango, un baile bien porteño" Corrigidor Publisher Buenos Aires. Tango guide "El Compadrito" and "La Milonguita"
about 20 postcards, 4 VHS videos and 2 CDs.